Apple has released the fourth public beta version of macOS High Sierra 10.13 and iOS 11. The build arrives after the release of iOS 11 developer beta 5 and macOS 10.13 dev beta 5 a day prior and includes the same changes as the developer version, including minor adjustments to some icons in iOS. Additionally, tvOS 11 public beta 4 is available for Apple TV beta users. iOS 11 public beta 4 and macOS High Sierra 10.13 public beta 4 are available to download now through the respective software update mechanisms on a Mac, iPhone, or iPad. In iOS, that is within the “Settings” app, and on a Mac that is within the Mac App Store Updates section. tvOS offers system updates through the Apple TV Settings app as well. Any user can participate in the public beta program for iOS and macOS, however beta system software is notoriously unreliable and offers a buggier experience than a final system software build. 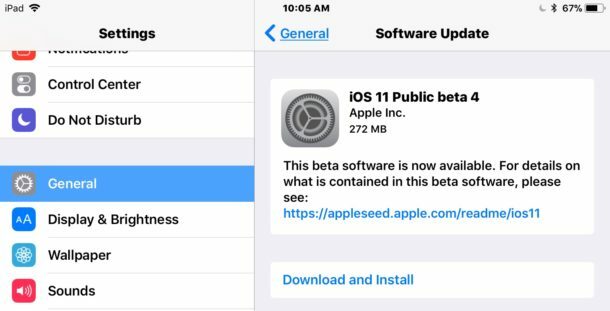 Those interested in installing iOS 11 public beta or running macOS High Sierra public beta can enroll any compatible computer or device in the respective beta testing programs through Apple. Users should always backup a device before installing beta system software, and ideally use hardware that is not primary devices. Final versions of MacOS High Sierra, tvOS 11, and iOS 11 will be released this fall. 1- FaceTime now has lovely dial out tone that will not pierce your eardrum. 2- Messages no longer have the icloud sync option (but they still sync, so I dont know what that is all about).